Aspire Energy’s natural gas infrastructure company is based in Orrville, Ohio. An operations center is also located in Athens, Ohio. Our Ohio business has operations in 40 of the 88 counties throughout the state with more than 2,600 miles of pipeline systems and right-of-way in the Marcellus and Utica shale production areas in central and eastern Ohio. 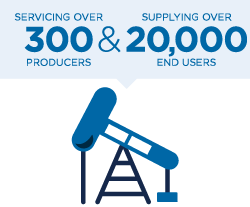 Aspire Energy provides natural gas midstream services, processing and transportation services to more than 300 producers and wholesale natural gas supply to approximately 20,000 end-users in Ohio. Aspire Energy also supports operation of Consumers Gas Cooperative. Gas from our gathering systems that is not distributed to local distribution companies or other end-users is transported to interstate pipelines. To connect with larger interstate pipelines, the gas must first be compressed and if needed, processed to remove natural gas liquids (NGLS). Aspire Energy operates 11 compressors and two processing plants in Ohio. We pursue investments that provide incremental demand for natural gas which includes constructing pipelines to serve shale production and conversion of fuel oil and propane consumers. By identifying innovative solutions we serve our existing markets and reach out to new markets with new service offerings.